While I was in Amsterdam I took the opportunity to soak-in what the city and country had to offer— a bicycle infrastructure that puts my city to shame, bollen around ever corner, Sinterklaas and his culturally problematic sidekick, the Rijkmuseum, the Van Gogh museum and, finally, the Anne Frank House. Getting tickets to the latter turned out to be a bit of an ordeal. In typical fashion, I did not do a tremendous amount of reserach on any of these things before arriving. I spent most of my time fretting, pracitcing and reworking my talk! 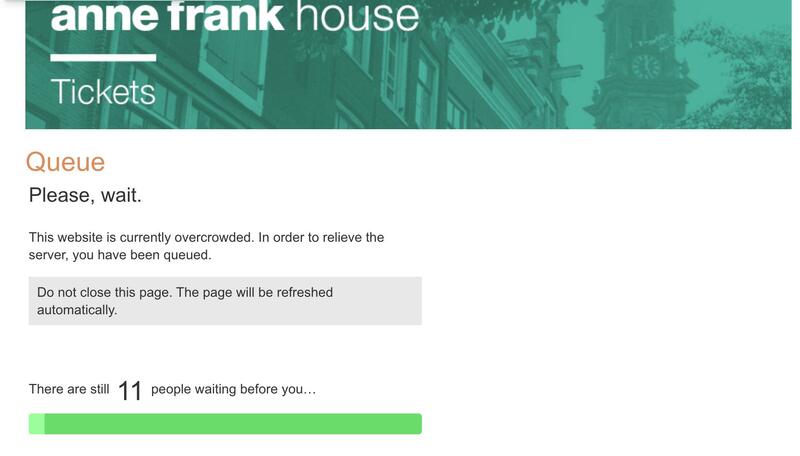 When I finally looked into buying tickets to the Anne Frank House however I was bummed to learn they seemed to be sold out for more or less the next couple months! The Anne Frank House has a peculiar ticketing system. Ticket can only be purchased online. That means you can't just walk up to the gate and buy a ticket to enter, no matter how nicely you ask them. I tried. My next assumption was that other tour groups buy up the tickets and resell them as part of their tour packages, but this is heavily frowned upon and supposedly does not happen. What you can do though is use their wonky online ticketing system. The sell 80% of the tickets for any particular day two months ahead of time. The other 20% of the tickets are released on the day-of. They say this very clearly on the ticketing page, but I learned something I did not expect when talking to the ticket person outside the museum about this: They don't release that 20% all at once! The first day I logged on to try it I saw the screenshot above with the queue and was too late to get any. I'd assumed they released that 20% all at once at the beginning of the day, but they don't! They release a few of them every hour or so throughout the day. You just have to constantly refresh the page throughout the day. I did it every 15-30 minutes and eventually found a ticket around 11am for later in the afternoon. When you do find a ticket this way you'll have to act fast! They disappear very quickly. Obviously, if you've planned your trip far enough ahead of time and know you want to visit, it's probably easiest to buy your tickets out a couple months. If you have a group that's larger than two people I'd highly suggest this — I never saw more than 2 tickets available at once every time I reloaded the ticket page. But, if you're like me, you can probably get lucky and nab a ticket this way. My suggestion would be to stay flexible and simply plan on being in the city most of the day so that you're close enough to run over and visit if a time slot opens up. There's plenty of other stuff to see in Amsterdam to bide your time. I'd just about given up on visiting the museum until I discovered how the ticketing works. Having seen it now, I'm very glad I didn't miss it. It's a very powerful museum and worth hassle.